The OSCO Construction Group's Rebar Division is dedicated to producing a fabricated reinforcing steel product that meets or exceeds the requirements specified in the contract documents, designs and specifications. We have over 50 years experience in fabricating and supplying reinforcing steel for all types of construction projects - from large scale industrial to smaller retail. The Division was expanded in 2009 with the acquisition of AllStar Rebar's Nova Scotia plant - one of the largest rebar processing plants in the province. Our rebar is detailed using the latest CAD technology offered by Bentley Microstation/ASA to CSA, CRSI and ASTM specifications. The annual combined capacity at our Saint John and Bedford plants is currently 18,000+ tons. Estimating, detailing, shop scheduling, tagging and shipping is performed using a computerized production management system. 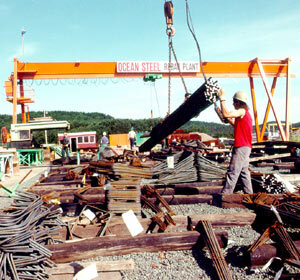 Rebar is installed using in-house or subcontracted crews depending on the project requirements.